Here is a video that shows the moisture, that is pounding CA and falling as snow further east (February storms), as having its source in Hawaii from generators on the Hawaiian islands. As I watched this video I realized that most of the footage is over the ocean, and it also shows the weather front passing over CA and continuing across the US, dropping its payload as rain and snow. There aren’t any generators between the Hawaiian islands and the west coast of the US, because it’s all ocean – yet there was lots of footage on the vid of “wild boiling off” of moisture, from sea level, into the air masses moving east overhead the ocean and the land. I slept on it because I knew the vid is a disinfo piece. But what was it hiding? HAN, G. et al., Science China Press and Springer-Verlag Berlin Heidelberg August 2013, Vol.56, No.8: 1447–1451. 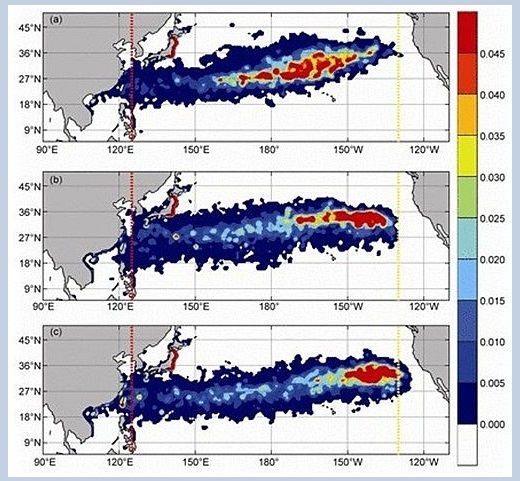 This morning I realized that it’s HAARP beams boiling off seawater in the Fukushima debris field (image above – Fig. 4) that stretches from the coast of China to the west coast of N. America. Bob Nichols reported a large increase in rad for the Bay Area in his last two field reports, and I kept wondering where that was suddenly coming from. Well, there were over 10 million garbage bags of highly contaminated debris etc. that the Fukushima workers bagged up and piled on the beach of the lagoon in front of the plant. Months later in September 2015, Typhoon Etau – a powerful typhoon (created for the job) – swept Fukushima garbage bags into the ocean, and that “plastic island of death” started moving east across the Pacific headed for our west coast. The bags and their radioactive cargo are somewhere between Hawaii and the west coast. My conclusion is that the US military is using HAARP beams on the ocean surface, from Hawaii to the west coast, to boil off moisture from the ocean in the most contaminated part of the Fukushima debris field (east of Hawaii – see Fig. 4), and directing it as unprecedented and offscale rain and snowstorms across America, to genocide the continent, and at times including Canada. The food bowl of America and the population of California are being completely contaminated permanently with fission products from Fukushima. In the center of this EARTH map on Feb. 20, 2017, two intersecting weather fronts are visible. One is traveling NE across Calif., and has a moisture trail behind it over the Pacific, indicating its origin was Hawaii. As it traveled over the San Francisco Bay Area and Central Valley of Calif. on Feb. 20, it intersected a stronger weather front covering the Central Valley and traveling NW. Where these two fronts intersected, the multiplier effect increased the amount of rainfall and wind velocity – right over the Oroville Dam watershed, as indicated by consistent daily rainfall maps. 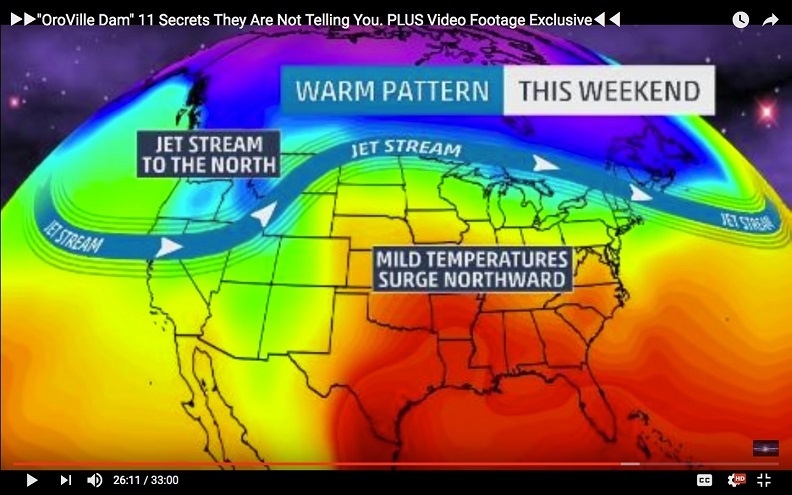 This is now irrefutable evidence that the weird storms and destruction of Calif. agriculture and the winter crops (sugar beets, wheat, alfalfa etc. ), is artificially generated and targeting the food bowl of America with flooding and pernicious radiation poisoning of the crops and environment of California. An identical operation is going on in the Caribbean where DU rad contaminated ocean moisture (from wars in Afghanistan, Iraq, Syria, Libya, Yemen) is being HAARP uploaded into air masses, that are seen traveling (the “weather front “rope” in the EARTH image above) N of New Orleans/Louisiana. There have been tornadoes reported hitting New Orleans and Louisiana – not a normal weather pattern for that region. In fact, that tornado “axis” from the southern states extending to Maine, has been a trajectory of tornado storms for a number of years – if people remember the southern states flattened and thousands of poor people homeless.